NASA's Aqua satellite provided a visible image of Super Typhoon Meranti as it continued to move toward Taiwan and the northern Philippines. 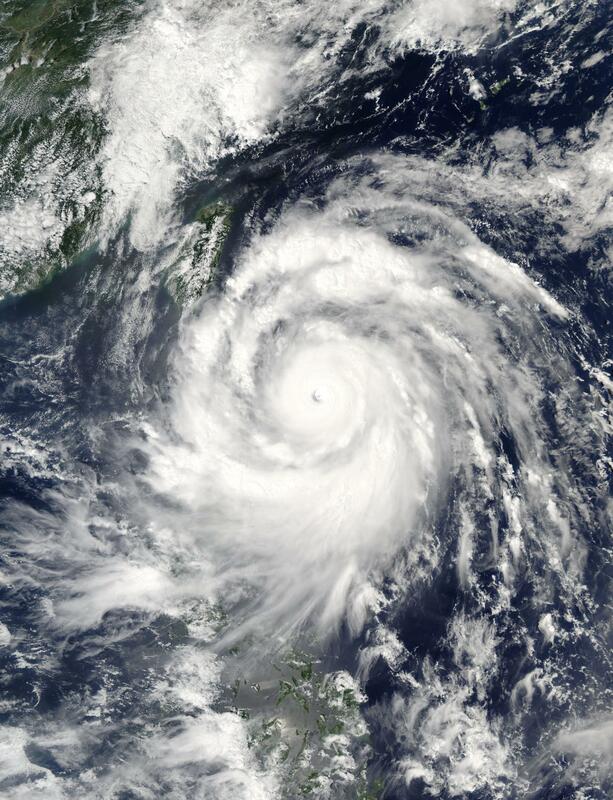 The Moderate Resolution Imaging Spectroradiometer or MODIS instrument that flies aboard NASA's Aqua satellite captured a visible image of Super Typhoon Meranti. The image showed a defined eye although filled with low clouds. Powerful thunderstorms surround the eye in a thick circular band. A large band of thunderstorms extends from the east of the center, and sweeps to the south of the center. Bands of thunderstorms from Meranti's southern quadrant were already over Luzon, the northern Philippines. On Sept. 13 at 1500 UTC (11 a.m. EDT), the maximum sustained winds in Super Typhoon Meranti were near 184.2 mph (160 knots/296.3 kph). Meranti is a Category 5 hurricane on the Saffir-Simpson hurricane wind scale. Meranti was centered near 20.5 degrees north latitude and 122.7 degrees east longitude, about 284 nautical miles south-southeast of Taipei, Taiwan. It was moving to the west at 16.2 mph (14 knots/25.3 kph). There are many warnings in effect. In the Philippines Luzon provinces under public storm warning signal include Signal #4 in the Batanes group of islands, Signal #3 in the Babuyan group of islands, Signal #2 in the northern Cagayan, Apayao, Ilocos Norte and Signal #1 in the rest of Cagayan, northern Isabela, Kalinga, Abra, northern Ilocos Sur. Warnings are also in effect in Taiwan. Meranti's center is expected to pass just to the south of Taiwan on Sept.14. Updated warnings can be found at: http://www.cwb.gov.tw/V7e/prevent/warning/I10big.htm?. The Joint Typhoon Warning Center forecast calls for Meranti to gradually weaken over the next 24 hours. The weakening process will accelerate as the Meranti approaches landfall in southeastern China on Thursday, Sept. 15.